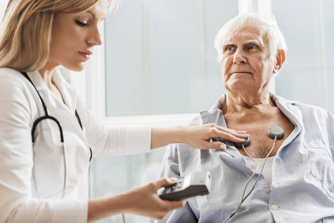 Margaretville Hospital provides a variety of non-invasive diagnostic procedures to help test for and guide treatment plans for patients suffering from or at risk for Coronary Artery Disease (CAD) and other coronary disorders. We use film-less Picture Archiving and Communication Systems (PACS) which allows our patients’ physicians instant access to their diagnostic images. For more information about these procedures, call 845.586.2631 ext. 3245. Captures live sonogram images of the heart to evaluate valves and mechanical functions using ultrasound technology. It can provide information about the presence of disease and the condition of the patient’s heart. These tests help your physician find out how the patient’s heart responds to cardiac stress. They may reveal abnormalities and blockages, and can guide further testing, diagnosis and treatment.